Good News! The Repository Pattern is now available as a free download from my pattern shop at craftsy.com. Enjoy! This is a confident beginner pattern. If you have done any foundation paper piecing, then you are ready for this pattern. If you haven't tried foundation paper piecing yet, you may want to check out my tutorial. Thank you so much to all those who visited my blog for the Sew Mama Sew Giveaway Day. That was such a blast! You guys ROCK! 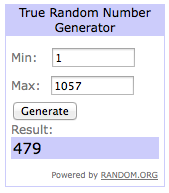 The winner has been selected and contacted. Congrats to Crystal in Canada! She was lucky number 479 out of 1057 comments. I am in awe here! Thank you for sharing this pattern. This is such a pure, lovely block. I voted for the one you made for the AccuQuilt contest. Thanks for this lovely pattern. I love patterns that have all the colors of the rainbow and this one fits the bill. Thanks for sharing your gorgeous pattern!! That is, in fact, what I was going for. Thank you for stopping by! Oh Katie...thank you for linking this under our Tuesday Archives Color Wheels themes...it's just awesome!!!! I need to make myself a fun, quilty color wheel to put right next to the one my mom made me!! Thanks for the inspiration! Pretty! And for free? You're so kind! Love the color wheel aspect. This is a gorgeous block! Thank for sharing it!! What a stunning pattern, thank you for sharing it, I'm off to download it now!